Want to join a book club but don’t have time to host a meeting on a regular basis? Want to chat with bestselling authors like Jane Green and Kristin Hannah? Then our online SheKnows Book Club is perfect for you! It’s free, easy to join and completely flexible. We’ve just announced our new August 2012 pick! Our SheKnows Book Club is online and flexible for your busy schedule. Read the book picks at your leisure, share your thoughts via social media (include #BookLounge and tag @SheKnows), and then join us online to chat with the authors and our SheKnows Book Club bloggers once each month. Here’s our new pick for August/September. 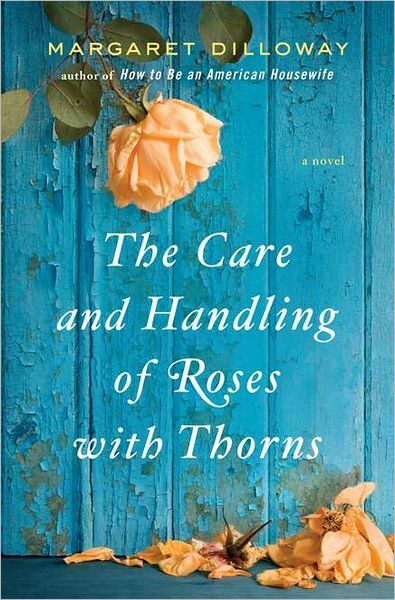 We’re pleased to announce that Margaret Dilloway’s The Care and Handling of Roses with Thorns is our new SheKnows Book Club pick for August/September 2012. Margaret Dilloway burst onto the literary scene with her debut novel How to Be an American Housewife. Now, she returns with her second novel, this time turning her attention to a thirty-six year old woman named Gal Garner. The Care and Handling of Roses with Thorns is the perfect fit for the SheKnows Book Club with so many themes to discuss. Thirty-six-year-old Gal Garner lives a regimented life. Her job teaching biology and her struggle with kidney disease keep her toggling between the high school, the hospital, and her home on a strict schedule. Only at home, in her garden, does Gal come alive. It’s here that she experiments with Hulthemia roses, painstakingly cross-pollinating various specimens in the hopes of creating a brand-new variation of spectacular beauty. But even her passion has a highly structured goal: Gal wants to win Queen of Show in a major competition and bring that rose to market. Then one afternoon Gal’s teenaged niece Riley, the daughter of her estranged sister, arrives. Unannounced. Neither one of them will ever be the same. Filled with gorgeous details of the art of rose breeding, The Care and Handling of Roses with Thorns is a testament to the redemptive power of love. We’ve made it simple and fun! We’ve picked the best books for you — a new selection every month. We love a good book as much as the next gal! And we know better than anyone how busy life can be — how sometimes things we love get put on the back burner. Like for instance, belonging to a book club. That’s why we’ve created our super convenient online SheKnows Book Club. It’s free, easy and flexible — completely geared to meet your busy schedule and to make it simple for you to be involved. You’ll feed your love of books and connect with other busy women, book lovers and authors. There’s just 4 easy steps to join! Sign up with a username and password on the SheKnows message boards. It’s free and easy. You can create a profile, add an avatar and signature information so other members get to know you. Sign up on the SheKnows message boards to begin. We have pre-selected some fabulous books to discuss for the year! Get the books and begin reading and discussing with other SheKnows Book Club members — and invite your friends to join — on the dedicated SheKnows Book Club message board. You can start posting to the official SheKnows Book Club message board as soon as you join. There you’ll find discussion threads about the book from our book club host, our official book club bloggers, other book club members and sometimes with the author of the selected book. We have new conversations starting all the time — sometimes about themes in the book, current events and other related topics. You can post a new thread or respond to the discussions going on at your convenience — any time and as often as you like. Continue to check back for new content — we’ll post reviews, interviews with the author and other content. At the end of each month, we will have an official discussion of the book where members, bloggers and the author will post and discuss the book one final time on Twitter, Facebook or our official SheKnows Book Club message board. We’ll announce in at the end of the month when the live chat will be and how to join. Jump in the conversations now and discuss the book selections with other readers, our book bloggers, and the authors themselves! So kick back in front of your computer, at your leisure, and join our official SheKnows Book Club. We’d love to have you! Still have questions? You can email our SheKnows Book Club host and we’ll get you all set.